Grao-Gayoso brings together the most pure artisan tradition and the most actual artwork; their creations in glasses and jewelry create tendency in the complex world of design. Basing their creations in the direct contact with the public via trade fairs and markets, this small artisan workshop is up to the most modern designs of big companies of the sector. Maintaining their work’s philosophy based in the respect towards the traditional techniques and the fidelity to their market, they’ve managed to become an obligatory reference of design, using their personalized creations. Grao-Gayoso’s history does not only pour the magic and nonchalance of the 80’s, it’s also a story of happy encounters. And we are not talking about the last advertisement of Coca Cola! Their main characters are Isabel (Zaragoza) and Javier (Lleida). Nevertheless, nothing would have been possible without José (Zaragoza), the godfather of this history. Even though many people have tried to take control of the brand in exclusive, the scenario of the movement happened in all the Spanish territory, north to south and east to west. Madrid was the meeting point of all the initiatives and suggestions, rather than being the epicenter of the movement. And Zaragoza was an exceptional scenario. True is, that in those days, creativity appeared to have no limits; in addition, there were many ways in which people could express freely, without fear. Finally, the design emerged because there was a great collective demanding it. Isabel started designing unique glasses models for her closest circles, once terminated her working day in the optic store, in which her father, José, also worked. From the small, familiar workshop, different models started to burst and were rapidly incorporated in the shop windows of different fashion stores of the city. Their models added colorful notes to the fashion melodies. Fashion and glasses design of Gray-Gayoso have been paired since then. José was a turner, long before the use of the machines was generalised in numeric control. He was, and is, a genuine professional, curious, detail oriented and tireless. A borned doer. He was the one to construct all the machines and auxiliary devices that we have in the shop. All this process can be seen in the video “The plastic frames”, which is published in our website. This has nothing to do with what we elaborate actually. His approach was totally different. When he finished in the optical store, he developed models for the neighborhood, who had problems; this were classic models for people who knew the details of the job. In any case, without José, the workshop would not exist: we are his inherits. I decided to start working as an apprentice in the optical store. My curiosity was picked for the job when he was already done with the workshop, and the movement was starting to generalise all around Spain. Why not develop glasses as people desire? My father didn’t have all the chances with him. We did four or five models, and we embedded diamonds and other ornaments. I presented them and they had an enormous approval! It was then when he started to take me seriously: we unpacked the machines, and when the working hours in the optical store were over, we worked till late. I started travelling around Spain and offering them in various shops of Madrid, Barcelona… The fact is that they were easily sold. It was the when Javier appeared. Javier, a rather hippie bijoutier, as Isabel describes him, self-taught, with a restless character, had experimented with all types of metal (brass and silver) and, punctually, with leather and stones. In the eighties, Javier ventured with other materials- resin, methacrylate, galvanised metal…and his designs achieved a more avant-grade character. The fact is that we liked each other and we started to work hardly. It was then when I quitted my job. I convinced my father and I achieved a feat: he saw the project clear, did his our bet and quitted his job too! It was difficult that the three of us could work together in the familiar workshop, because if there is something we don’t lack of is…character, but at the end this has been the situation till today. Finally, their paths got reunited in the ‘Grao-Gayoso’ brand. Both Isabel and Javier incorporated materials from each other, Javier started to use the acetate, with which Isabel experimented; and Isabel the metals, with which Javier had worked till then. From this fusion, different pieces of jewelry combining metal and acetate emerged, and the glasses incorporated metal rods and different fixtures. We both shared the same sensibility towards the design, the fashion and new trends. We wanted to be original, creating our own style. We started designing new collections and experimenting with alternative materials: resins, varnishes, engravings, leather, metacrylates…although always with the acetate paste and the different metals- silver, brass, low fusion metals…-as support. We’ve never had problems mixing materials. Even so, our passion for fashion has been, and will always be essential in our collections. When we embedded in the fashion world, magazines as Elle or Vogue, newspapers such as El País or monographic television fashions programs got notice of our job. They were shocked to discover that such a small workshop could elaborate these so modern glasses. We took part in several travelling exhibitions with complements designers of the time: Chelo Sastre, Chus Burés, Joaquín Berao, Sybilla…, and in specialized trade fairs and shows like Gaudí, with collaborations in the Cibeles catwalk of Madrid. More recently we’ve had presence, in professional trade fairs like Bisutex (Madrid), Expohogar (Barcelona) and Bijorka (Paris). We’ve also attended craft fairs in Italia, France and especially, Spain. We worked for the Expo in Seville and our collections were in the Aragonese pavilion of the Expo of Zaragoza. Since then, we have been in different expositions, mainly in Aragon. In addition, our workshop has been a benchmark in different artisan books. Recently, we have opened our own shop were we offer our products, together with other designers collections. However, they weren’t blinded by the fashion show lights and the vanguards sparkles. They still are a small familiar workshop, loyal to their surroundings, their neighborhood and their friends, although their old street has been moving square to square, door to door. By now, very few Torrero`s neighborhood parcels (Zaragoza) still maintain their original inner backyard and their horizontal dimension to human scale. Shadowed by the new vertical buildings, Isabel and Javier still brainstorm in their small workshop their ideas. Unfortunately, the pressure exerted by promoters and constructors has undermined the original aesthetic. When we started, there were quite a lot of workshops like ours in Spain, but they sold simpler materials because of the price, reminds Isabel. What still remains untouched since then is the exclusive creations of glasses for an exceptional customer: Martirio. Our production is limited because we only want to design what we like at the moment. Our work includes two faces: the strictly creative one, were the investigation of new forms and materials is done, and the design of prototypes is developed, that lasts the whole summer; and the productive face, during winter, maybe the most boring part as it is purely mechanical, but compensated when the material is exposed in fair trades, surprising our customers with new designs. 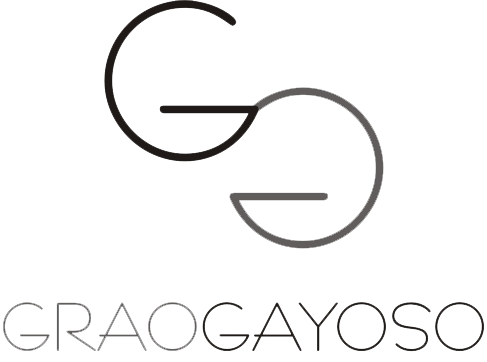 The ‘Grao-Gayoso’ products have presence mainly in optical stores, museum shops and fashion establishments, in which singularity, design and avant-grade objects prevail. In any case, we usually present two samples-catalogues per year with approximately twenty models, which include the top bestsellers of previous seasons. Afflelou,Afflelou, how may glasses will you do…! What we really want, overall, is to enjoy whatever comes in the future.